The United Arab Emirates (UAE) has re-opened its embassy in Syria, taking a major public step towards welcoming Bashar al-Assad back into the fold of Arab leaders after years of estrangement. Syria was suspended from the Arab League shortly after the Syrian war broke out in 2011 and most Arab states closed their embassies in Damascus in protest at Assad’s violent crackdown against the opposition. However, as it has becoming increasingly clear that Assad is likely to stay in power and prevail over downtrodden rebel forces, Syria’s Arab neighbours have begun moving to restore diplomatic ties with the former pariah. The re-opening of the UAE’s embassy in Damascus is the most significant public step so far towards Assad’s rehabilitation in the Arab world. The move is likely to have been coordinated with Saudi Arabia, the UAE’s more powerful neighbour and close ally. Syria state media reported that Bahrain may re-open its own embassy in Damascus next week. One complicating factor is the role of Iran, which has strongly supported the Syrian regime throughout the seven-year war but is considered a major enemy by Saudi Arabia and its Gulf Arab allies. 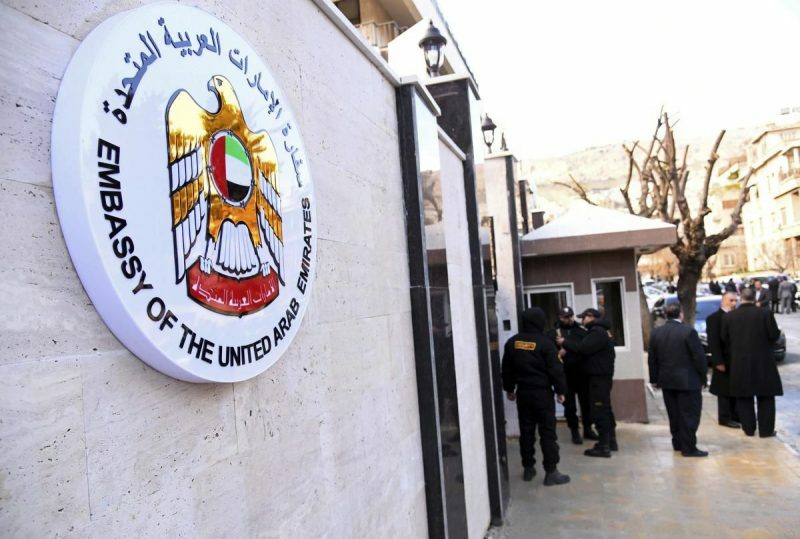 In a statement, the UAE presented the embassy re-opening as a part of an effort to bring Syria back into the orbit of its fellow Arab states as opposed to its Persian Iranian allies. The UAE said said it was keen to “restore relations between the two brotherly countries to their normal course” and wanted to enhance “the Arab role” in supporting Syria’s independence and sovereignty. “This move will also prevent the dangers of regional interference in Syrian affairs,” the UAE foreign ministry said, in a veiled reference to Iran’s role in Syria. The UAE helped finance some anti-Assad rebels in the early stages of the the war but played a smaller role than Qatar, Saudi Arabia or Turkey. Much of the Gulf funding for rebel groups has now dried up. Jalel Harchaoui, a lecturer in geopolitics at Versailles university, said both the UAE and Egypt had grown sceptical about overthrowing Assad because they saw him as a bulwark against their shared Islamist enemies. “As Assad’s survival in Damascus is now an indisputable fact of life, and as the West’s 2012 bet appears as a miserable failure, the ideological stance of the UAE and Egypt is being largely vindicated. Both states will now lead the campaign consisting in having the rest of the Arab world embrace that reality,” he said. 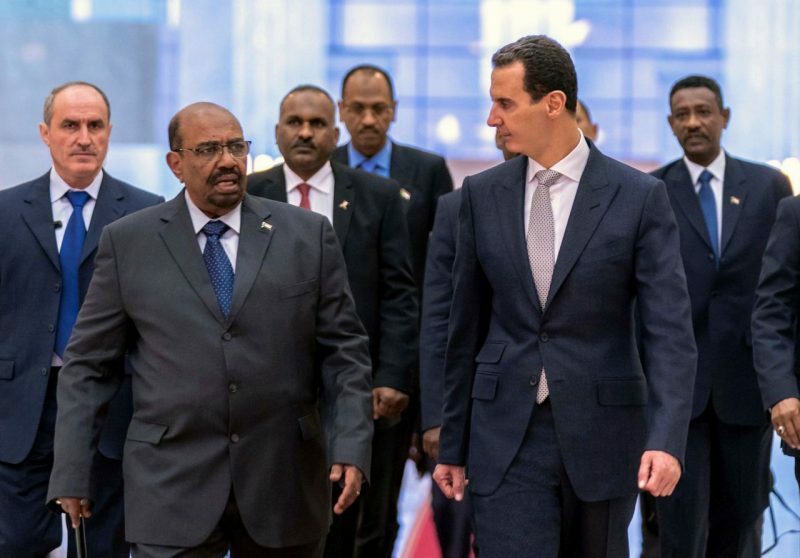 Omar Bashir, the president of Sudan, this month became the first Arab leader to travel to Damascus since 2011. His visit was hailed by regime media as sign that Syria was being welcomed back in from the cold. There also appears to be increasing momentum for Syria to be re-admitted into the Arab League. Ahmed Aboul Gheit, the Egyptian who serves as the League’s secretary general, said earlier this year that Syria’s suspension had been hasty. The next meeting of the Arab League will take place in Tunisia in March. Thursday also saw the first commercial flight from Damascus to Tunisia since 2011. “This trip is the reopening of tourism links between Syria and Tunisia,” said Moataz Tarbin, the head of the tourism firm that organised the flight. Syrian state media said earlier this week that Major General Ali Mamlouk, one of Assad’s top security officials, had visited Cairo to discuss terrorism issues with his Egyptian counterparts. The UAE’s charge d’affaires at the embassy resumed work on Thursday as the UAE’s red, black, and green flag was hoisted for the first time in seven years. Syria regime media showed last-minute construction work to restore the UAE’s state seal on the embassy’s outer wall. “The UAE expressed its wish that peace, security and stability would prevail throughout Syria,” the foreign ministry said.